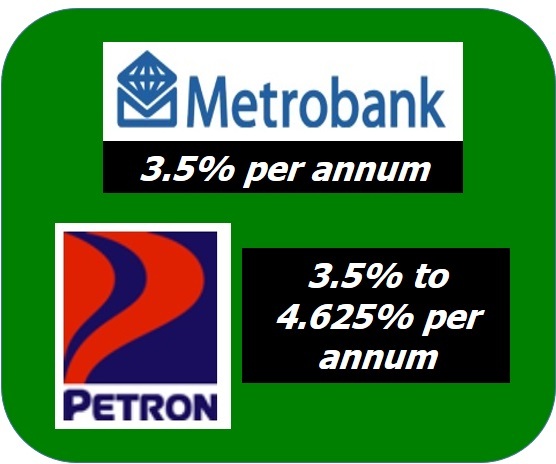 Metrobank (PSE: MBT) is offering Long-term Negotiable Certificates of Time Deposits (LTNCDs) while Petron Corporation (PSE: PCOR) is offering corporate bonds. Unlike the usual bank time deposits, the LTNCDs cannot be pre-terminated. Rather, it can be sold in the secondary market (hence the word negotiable), in case owner has to liquidate/ unlock his time deposit. Metrobank says it is taking advantage of the strong liquidity in the Philippine monetary system, as well as the low interest regime, for it to lock-in its cash needs for long term funding. We previously shared with you corporate bonds of SMC Global Power Holdings, which is technically, a sister-company of Petron. We also shared previously the preferred shares issued by SMC, again another related company. So this time, Petron is the one raising funds. If you think concentration risk is manageable, read on (anyway these are all big companies even if they are related through ownership). Target listing date is October 21. Underwriters are SB Capital, (PSE: SECB), BDO Capital and Investments (PSE: BDO) and BPI Capital (PSE: BPI). If interested, go to their nearest branches. I suggest you don’t wait for the public offer period as banks (who represent their Capital Corp arms) accept reservations anyway. Again, note that rates are still indicative at this point, but final rate should be within provided range. Quoted rates are also gross rates, which means, as you’ve guessed, subject to taxes. Petron’s bond rating is Aaa, funds to be used to refinance existing short and long term debts, and for other general corporate purposes. Found this article helpful? Share with a friend who’s looking for an investment option. Like us on Facebook, Instagram and Twitter. Join me in Truly Rich Club and enjoy the many financial and spiritual benefits I get. You may also want to donate and support our advocacy, via Paypal. Not yet a member? Subscribe to our mailing list to get articles like this straight to your inbox. Absolutely for FREE. Photos: Company logos are from the respective company websites.